Since 2003 millions of men, women and children have been displaced by the ongoing conflict in the Darfur region of Sudan. Darfur is in the west of Sudan and is about the size of France. 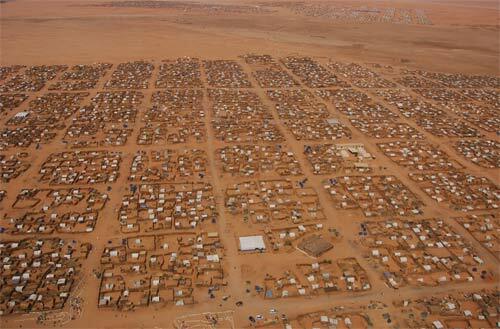 Over 2 million people are now crowded into camps in arid desert areas. These people are the "lucky" ones as many many others (around 400,000) have been killed so far. One of the camps for displaced people in Darfur, Sudan. Displaced people in Darfur cook their one meal of the day (which is all they can usually afford) on wood fires or clay stoves. Firewood, already scarce, is becoming more and more so and deforestation/denudation is occurring. Venturing outside of the camps for longer and longer firewood foraging missions is no joke. It is mostly the women that forage for firewood and when they leave the safety of the camp they face the very real possibility of being attacked, killed or raped. Firewood is also being sold but the displaced persons in the camp have very little money - some end up selling part of their food ration in order to buy firewood and so avoid the dangers outside of the camp. 40% of displaced people in South Darfur do this, 80% in North Darfur. 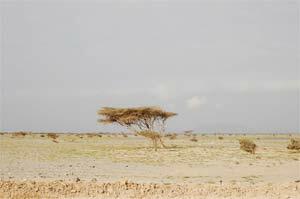 Even when they have not had to sell part of their food ration people are still missing out on meals for lack of firewood (50% of displaced families in South Darfur, 80% in North Darfur). The firewood that they do have does not last very long as their existing open fires and clay stoves are inefficient. Displaced Darfur women try out the Darfur stove. 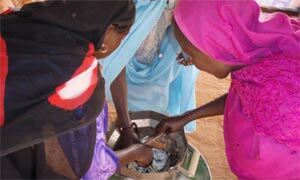 In 2004, CHF International, in partnership with the Lawrence Berkeley National Laboratory at the University of California, Berkeley, and Engineers Without Borders-USA, began work to design and implement a sustainable, fuel-efficient cook stove for displaced people in Darfur, Sudan. The Darfur fuel efficient stove has been designed in consultation with the people themselves so that it meets their needs. 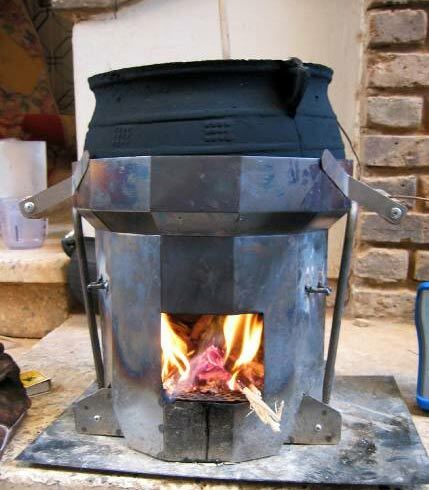 The stove is 75% more fuel efficient than the traditional 3 stone fires commonly used in Darfur and over 50% more fuel efficient than the clay stoves also used. The stove lasts much longer too: a minimum of five years. The Darfur fuel-efficient stove can effectively double the disposable income of a woman at one of the camps as well as reducing the risks to which she is exposed by reducing firewood foraging times. 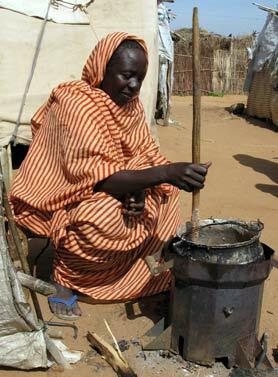 Halima using her Darfur fuel-efficient stove. Halima came to the displaced persons camp three years ago with her husband and 6 children. She received a Darfur fuel-efficient stove in June 2007. The new stove model meant that she was able to reduce her expenses on fuel-wood by two-thirds. Her household savings immediately saw a dramatic increase. By the end of the third week, she could afford school uniforms and books for two of her children. By the second month she had enough capital to start a small business selling charcoal. Today, Halima's family is living a much healthier life - she can afford to feed them meat 3-4 times a week and can buy more fresh fruits and vegetables. Halima says her best advice for women who have a Darfur stove is to save the money well, and use it to improve quality of life for their families. Open fire cooking is not only inefficient it also means that the dense straw-and-stick shelters and thin material tents in use in the camps are at a higher risk of burning down. Because the Darfur stove completely encloses the flames there is a much lower risk of this happening. The Darfur stove encloses the flames of the fire. The Darfur stove makes a lot less smoke than the alternatives which means lower rates of respiratory and eye problems as a result of indoor cooking. Because it takes longer and longer to find wood, women in Darfur, Sudan are spending increasing amounts of time foraging for wood. Because the Darfur fuel-efficient stove is up to 75% more efficient than the alternatives this frees up a lot of time for the women. This time can be spent on other activities, resting, or making a pursuing a supplementary income. The Darfur stove also reduces deforestation/denudation ensuring that the wood supply will last for longer, reducing carbon emissions and helping to reduce erosion and the other negative side effects of deforestation/denudation. Darfur stoves are made in Sudan. 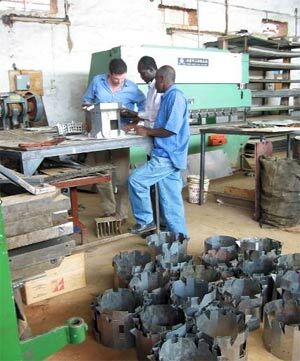 The Darfur stoves are made in Sudan by local people - this helps the local economy and, provides employment and means that the project can easily expand and be run by people in Sudan. The design is such that it does not require advanced technology and the stoves can be made quickly and cheaply. Darfur stoves are subsidised and are sold at higher than scrap metal value to the displaced people. The fact that the Darfur stoves are sold and not given away means that the local economy is not destabilised and that the stoves are looked after and not sold to pay for food. 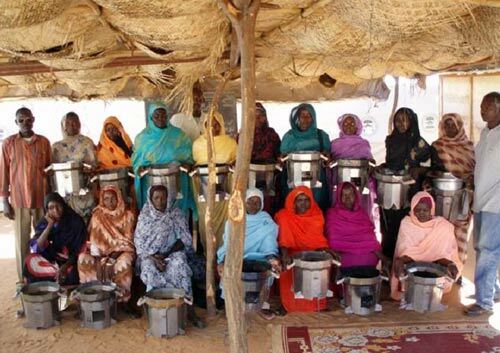 You can now support the Darfur stove project online through DarfurStoves.org. In December 2007 Stovesonline subsidised 20 Darfur fuel-efficient stoves. At the same time we also started subsidising 3 Darfur stoves every month. This means that in December 2007 20 displaced families got to have immediate, tangible, benefits due to using their fuel-efficient stove, and 3 more families every month thereafter. Initial testing of the Darfur stoves.